In memory of his artistic great-great-grandfathers, Blas Maria Colomer, a musician, and Jean Joseph Weerts, a portrait painter, Patrick Colomer is supporting three young artists. Blas Maria Nicolas Ramon Constantino Colomer, born on 3 February 1839 in Valencia, Spain, started to study music theory at the age of four under the direction of renowned Cathedral organist, Pascual Perez. He continued this until the age of eight when he started to study piano under the same teacher. As Mr Pascual Perez’s lessons were too infrequent (one half-hour session following Sunday services) to enable young Colomer to develop his musical ability, it was decided, at his teacher’s suggestion, to entrust his education to another teacher, who he could see more often. So, Mr Justo Fuster was assigned to teach young Colomer. He made such quick progress that after two years, at the age of 10, he could be heard in concerts in Valencia and, principally, at the Liceo Musical, an artistic center where he performed the Variations of Mozart and other classical works. At around the age of 12, while continuing his study of the piano, an exceptional soloist at the Grand Théâtre, named Manuel Lloria, became his violin teacher. After two years, and following an entrance exam, Colomer was able to join the orchestra of the Teatro Principal of Valencia, and that of the Princesa where an Italian ensemble performed Il trovatore, la Traviata, Rigoletto, Lucia di Lammermoor, Norma, etc. After being chosen to play the piano at the café “Del Siglio”, he met a compatriot among the customers who described Paris and the welcome given to artists there in such a way that he eagerly asked his parents for their consent to go to Paris to perfect his art. In May 1856, the death of his mother, whom he loved dearly, led him to advance his departure. Arriving in the capital on 16 September 1856 with no knowledge of the French language and just a small amount of savings, he made an effort to find a few classes to make a living from and worked hard in order to gain entry to the Conservatoire. One of his patrons in Paris gave him the opportunity to take lessons from Mr Portehaut, a piano teacher at the Conservatoire. Sometime later he was introduced to Mr Carafa, a member of the Institute, who, after hearing him play, introduced him in turn to the great professor Marmontel, who then brought him into his class as a listener. On 1 February 1857, he publicly performed Schubert’s Serenade, transcribed by Prudent, at a music festival in the Jardin d’Hiver on the Champs Elysées. After the Conservatoire de Paris exams were postponed until April, he was admitted unanimously along with Lavignac and Ketten, and all three became students in Marmontel’s class. He competed for the first time in 1858 but only took second place: As E. Guiraud was in his final year, he was awarded first place, given that the Head of Beaux-Arts, Marshall Vailaint, had decided that no award could be shared. It was for the same reason that he did not take first place in 1859; it was awarded to Massenet for whom, like with E. Guiraud, it was the last chance of competing. Finally, in 1860, he was unanimously awarded first place , as seen in the Gazette Musicale’s appraisal on 29 July 1860: “The winner of this year’s first place, Mr Colomer, is already an artist; he will certainly be talked about just like Francis Plante and several others that Mr Marmontel is understandably proud of counting as former students of his”. His personal likes and dislikes led him to the teaching profession and, despite his teacher Marmontel believing he had a future at the piano, he dedicated himself once and for all to teaching. After his first prize for piano, he composed a march entitled Marruecos, dedicated to Queen Isabella II and at the end of November 1860 undertook a trip to Madrid. It was, however, very difficult to be heard by Her Majesty. Nevertheless, after a long wait, he succeeded in seeing her and could only congratulate himself on the kind welcome he received at the palace. His stay in Madrid ended with two orchestral concerts; one performed at the Del Circo theatre for his benefit and the other at the Zarzuela theatre for the benefit of flood victims. 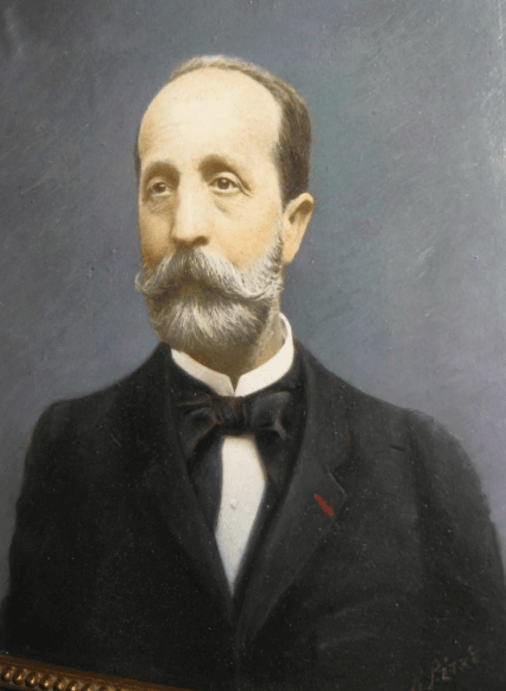 Upon his return to Paris, he joined the harmony class of F. Bazin, Conservatoire professor, in which he was unanimously awarded first prize for piano in 1863. He married one of his students, Céleste Claire Clémence Cendrier, who was the daughter of the architect of the Gare de Lyon in Paris and the Gare de Perrache in Lyon. Two children were born from this marriage: Madeleine, who died without children, and Félix, who became a mining engineer and travelled around the world. Since he did not want to drop his many students, he left the Conservatoire and the studies that would have enabled him to win the Prix de Rome. He began working hard and composing, all whilst playing at shows, as well as at concerts at the Société Nationale and the Association of French Composers. He played in Châteaudun, Reims, Brest, Tonnerre, Le Mans, Dieppe, Angers, Tournai and at the Opéra Comique in Paris on 21 May 1888, where he performed his Concerto with orchestra. Among his students, some would become composers, of which the most well-known would be Maurice Ravel. In 1868, he obtained French citizenship in order to take part in the national Opera competition with his opera La coupe du Roi de Thulé. Among the high-profile competitors were fellow students Guiraud and Massenet, but it was Diaz who was to win the prize. The session ended with a Concerto for Piano and Orchestra by B-M Colomer. The list of his works are given hereafter: Polonaise (Orch. ), Légende (id), Nina, for vocals: these three works were honored during the 1882 competition (Regional Association) and performed on 20 March 1882 by the Société des Grands Concerts (Champs Elysées), and in April 1882 by the Théodoric. Trio for Piano, Violin and Cello (1880), Duo for Oboe and Piano: these two works were honored by the Association of Composers and performed at the Salle Pleyel in 1884. Les Noces de Fingal, a lyrical drama in four parts based on the poem of Judith Gautier (Rossini competition), was awarded a prize by the Institute and performed by the Société des Concerts au Conservatoire (October 1889). Sextus, a lyrical drama in six parts (City of Paris Competition, 1896) received an award but was not performed. His other important orchestral works include: Les Scènes Antiques, performed in Paris at the Château d’Eau Concerts in October 1887 and in Monte Carlo, Chasse Fantastique, performed at the Lamoureux Concerts in June 1897, and Symphony (Le Mans in 1900). He composed numerous works of chamber music: Roneto for wind instruments (Salle Pleyel, 1884), Quintet for piano and strings (Salle Pleyel, 1887, and Grand Palais at the Société Nationale des Beaux-Arts, 1907), Quartet for strings, Sonata for piano and cello (Grand Palais at the Société Nationale des Beaux-Arts). He also composed a vast array of piano pieces, around 200 pieces from different genres and others that were especially for teaching: DO RE MI FA SOL, a work in five parts written using five notes, Ecole Nouvelle in four parts, six easy sonatinas, two Ecole Nouvelle exercise books, two nursery school workbooks, two modern classical studies workbooks, collaborative piano exercises for 8 hands - four workbooks, 24 melodic preludes in all tones- two workbooks, piano music theory (four handwritten exercise books), cross rhythms (exercises and studies), playtime for children (12 pieces), study of music theory, additional lines. His works for vocalists include: Les sept paroles du Christ; Oratorio for Soloist, Choirs and Orchestra; La Fiesta, operatic drama for Soloist, Choirs and Orchestra (performed in Paris at the Société de l’Euterpe and in Le Mans by the Mixed Choir); Two Psalms for Soloist and Orchestra; one Gloria; one Credo Agnus Dei; Kyrie; chorales, duos and melodies. Named Professor of Higher Education in Piano in the Maisons de la Légion d’Honneur in February 1900. At these schools he taught students who would all go on to become female teachers and tutors. Blas-Maria Colomer died on 29 June 1917 in Paris. 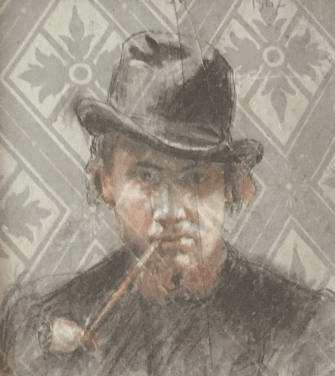 Story of the self-portrait owned by Patrick Colomer: A young student at the Beaux-Arts in Paris, Jean-Joseph Weerts produced this self-portrait in charcoal on the wallpaper of his student bedroom following a fire that had destroyed his canvasses in 1867. Weerts (Jean-Joseph), a French painter, was born in Roubaix in 1847 and died in Paris in 1927. His work was composed of two collections: historical or decorative paintings, and small portraits. As a painter of important subjects, Weerts works included: Jésus-Christ descendu de la croix (1875); La Légende de saint François d’Assise (1877); the large color painting Mort de Joseph Bara, (1883);Ll’Exorcisme au moyen âge (1888); Nuit du 9 au 10 thermidor (1897); Concours d’éloquence sous Caligula (1911 for the Lyon Faculty of Medicine); etc. Weerts’ significant decorative paintings include: Franchises de la ville de Limoges, ceiling painting for the Limoges town hall (1887); the ceiling of the Hôtel des Monnaies museum in Paris; Fête du Lendit ou Foire aux parchemins à Saint-Denis, au XV siècle, for the New Sorbonne. In his portraits, Weerts chose to paint in small frames, adopting a slightly glossy style. He painted a considerable number of well-known people, including: Vaudremer (1902); Robert-Fleury; Henry Roujon (1904); Paul Doumer; Liard (1905); Roll (1906); Paul Renouard (1920). Sélim Mazari is amongst France’s most promising young pianists. Having been awarded a degree with first class honors from the CNSM of Paris (Conservatoire de Paris) in June 2011 at the age of 20, he is currently continuing his studies at the CNSM in Claire Désert’s class of 2012-13. He will be emigrating to London at the start of the next academic year to be taught by Dmitri Alexeev. Working at his side, his teachers Suzel Ginisty, Pierre Réach at the CRR Paris, and Brigitte Engerer at the CNSM have played an important, or even fundamental, role in his career debut, not to mention the pianists Rena Shereshevskaya, Jean-Claude Pennetier, and Elena Varvarova, who have given him valuable advice during masterclasses. He has already performed at several festivals and national venues in France and abroad, in recitals, as a soloist with orchestra and in chamber music settings. He was one of the discoveries of ADAMI 2012 and also regularly plays for the associations “Nouveaux Virtuoses” (New Virtuosos) and “Jeunes Talents” (Young Talent). His first recording was a trio with flautists Juliette Hurel and Joséphine Olech, released in Spring 2012 by the label 1001 Notes and entitled Souvenirs de Hongrie. He performed his first concerto with orchestra, a tribute concert to Brigitte Engerer, on 17 February 2013 with the Cannes Orchestra under the baton of Pavel Baleff. On 24 February 2013, he won second prize in the Piano Campus Competition and tied for the public vote. Painter Marion Colomer has been living and working between Delhi and Paris since 2005. She joined the Ecole Nationale Supérieure des Beaux-arts in Paris in 2001, where she studied painting, lithography and photography. At the same time, she took university courses and, in 2004, received a Bachelors Degree in Modern Literature from Jussieu. In her works, she has portrayed members of Indian high society, Maharajahs, former nobility, and Indian celebrities. Her first contact with India was in 2003 during a one-month art training program in Chennai, then in 2004, with the support of the French Embassy in New Delhi. She then became interested in the untouchables and street people, including those on her own street, which resulted in a series of portraits of men from the working-class district of Maviya Nagar in Delhi. Today, she helps us see another India, that of princely interiors, that of aristocratic women. It is no longer the street populated with mainly masculine faces but rather a princely feminine intimacy. She views India with an anthropological eye, sometimes as the the street painter, sometimes as the court painter. However, her paintings are more than official portraits; they reflect the artist’s experience, which is integrated into her work in Indian-inspired decorative elements that recall the richness of the fabrics, the splendor of the jewelry, the softness of the embroidery, and the shimmer of the colors she has seen. In this way a madras (a simple checked cotton) worn by a man on the street is used as a medium for the princely figure lavishly dressed in silk, brocades and decorated with magnificent jewelry. India and its contrasts are conjures up through materials she uses, from the most rustic to the most refined. An India of façade: is the artist therefore suggesting an ‘appearance’ of magnificence when she subtly integrates embroidered glitter into the canvas, giving certain portraits a diamond sheen? Sometimes the faces are only perceived, letting themselves be concealed by the motifs that are imposed in abundance; sometimes they invade the canvas suggesting the swarm of crowds at a bazaar. Colors burst out, blend together, contradict each other and at times fade away, suggesting silence, or reflection. Modernity and tradition clash and intertwine. Marion’s paintings combine tradition and modernity. Her work demonstrates historical and artistic knowledge but also originality and inventiveness. The artist refers to Velazquez in the demeanor of a court maid; suggesting the French tradition with a cross stitch embroidered in the folds of a silk sari or playing with the reflection of pearls alluding to Vermeer. The contrasts of this modern India have made a mark on Marion Colomer. Her paintings, in their decorative aspect, offer an in-depth, yet delicate depiction of the contradictions of daily life in India, as well as Western and Eastern cultures. Nicolas Desbons is an artistic metalworker and sculptor. His work focuses on metalworking (the metal is worked while cold, then assembled through welding or screwing), however it also involves ironwork (working at a forge), when required by his creations. He combines traditional techniques, while seeking to innovate and divert from existing rules to invent a new aesthetic. In order to enrich his pieces, he readily uses a mix of materials and introduces fiberglass, glass, and ceramic into the metal. He works to order and it is possible to visit his workshop in Montreuil, where he produces furniture and interior fittings for private individuals and architects.